Cumberland County College’s Service Learning Program is an interactive teaching method that blends meaningful community service with the content, objectives, and assignments of a course. The Service Learning Program helps students learn through experiences outside of the classroom. This has become a great program for the college and students. One of projects that the Service Learning Program created was The Domestic Violence Awareness Day led by faculty member Kate Mathers. Domestic Violence is a pattern of abusive behavior in any relationship that is used by one partner to gain or maintain power and control over another intimate partner. This event was also part of the National Service Learning Organization Campus Compact. The benefit of the project is that victims of domestic violence made contact throughout the community in moving forward with their lives. This is such an important national topic that Campus Compact requested that CCC’s Domestic Violence Awareness Day was included in their service learning program. Campus Compact is a national coalition of more than 1,100 college and university presidents—representing some 6 million students—who are committed to fulfilling the civic purposes of higher education. This project was a combination of things like Domestic Violence Awareness, Domestic Violence Prevention, and the Arts & Healing process through movement, dance, and physical fitness. The event was held to educate people that there is a way out of an abusive relationship and to explain some of the early warning signs. This kind of abuse can cause economic stress as well. A featured part of the event included a student discussing her abusive marriage. She explained that at first, it was just an ordinary relationship and over time, it became an abusive relationship. As this abuse escalated and became more violent, she couldn’t find a way out. She sought help after a significant event — being thrown out of a moving car at 65 m.p.h. This event took place last spring in the Luciano Theatre on a Wednesday, from 2pm to 4pm. It was a combination of a project with students and the Domestic Violence Family Violence and Community Relations class (PY216). They created the event and they recruited professionals to participate such as prosecutors, lawyers, non-profit organizations, and former students who have been in an abusive relationship. An estimated 200 people attended this event. There were speakers who attended this event and answered audience questions. There also was a fitness instructor who discussed emotional and physical health as it pertains to healthy relationships. The instructor owns a profit studio and donates a percentage of the proceeds to benefit domestic violent victims. An art therapist who also attended the event created an interactive project with attendees to allow victims to express their feelings and emotions based on their life experiences. CCC’s Domestic Violence Awareness Day provided education and hope for people in abusive relationships. The event also sparked the beginning of the healing process for many attendees. Through events like Domestic Violence Awareness Day, CCC’s Service Learning Program helps educate and connect students and community members. For more information about Campus Contact visit http://www.compact.org or to participate in future CCC Domestic Violence events, please email Kate Mather at kmather@cccnj.edu. When was the last time you chose fresh produce over a McDonalds burger for lunch? In the United States, we as a society have become accustomed to a fast food way of life. In Belize, it is quite the opposite. Because of their non-commercial culture, they would much rather eat fresh, homegrown produce rather than processed and premade meals. The horticultural society at Cumberland County College experienced this first hand while on a service learning trip to Belize in the summer of 2013. Through agricultural sponsorships, the students in the Horticultural Society at CCC were able to raise the money to enrich their education and experience a whole new culture. The sponsorships helped offset the costs of airfare, transportation, and lodging. The trip was open to all business, agriculture, and horticultural students. Dr. James Price and Professor Maurice Sheets of the agricultural department led the excursion. During this trip, students saw what it is like to live off the land. “I saw no fast food places in Belize. All the food consumed is very pure and freshly grown,” says Price. The group’s main focus was to construct a greenhouse or “netting house” that would resist the large amount of insects as a result of the extended rainy season Belize experiences. The students worked closely with an elementary school in Burrell Boom, Belize. While there, they educated the community about how to farm year round with the aide of a greenhouse. They taught two classes; one class on the study of soil and the other on different insects. It built a very positive relationship with the school, since students taught modernized commercial culture to them as well. In the near future, the agricultural department plans to go to Belize again. 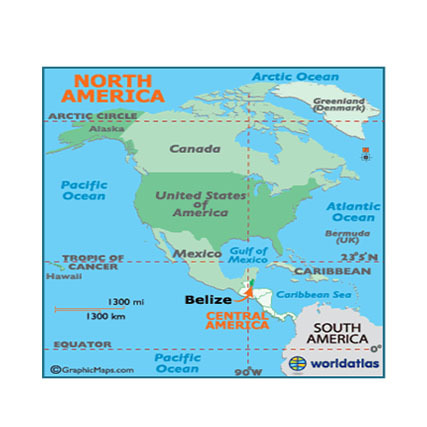 During the winter break of 2014, January 4-11, Price and his students will visit the whole country of Belize. They plan to visit the Mayan Ruins, San Pedro, Palencia, and Pandora Window Box Nursery. Working along with the University of Belize, they hope to learn even more about agriculture through another culture’s eyes. If you are interested in being a part of this step toward building lasting partnerships in agriculture around the world, email jprice@cccnj.edu and contact the Agridemic Forum, an agricultural club on campus open to students of every major. It is a great way to broaden your college resume, your cultural experiences and your outlook on a healthy lifestyle. This service learning newsletter was written by students in the EN-231 (Journalism/Newswriting I) class and designed by students in the EN-241 (Publication Layout & Design) class. Over the years, childhood obesity has become a troubling issue that concerns parents, educators, and physicians. There is awareness of the issue, but now the focus is on trying to find a course of action, and a guideline for the public to be able to follow. Michelle Obama has begun to take action to combat the issue with the launch of a new reference chart known as MyPlate. 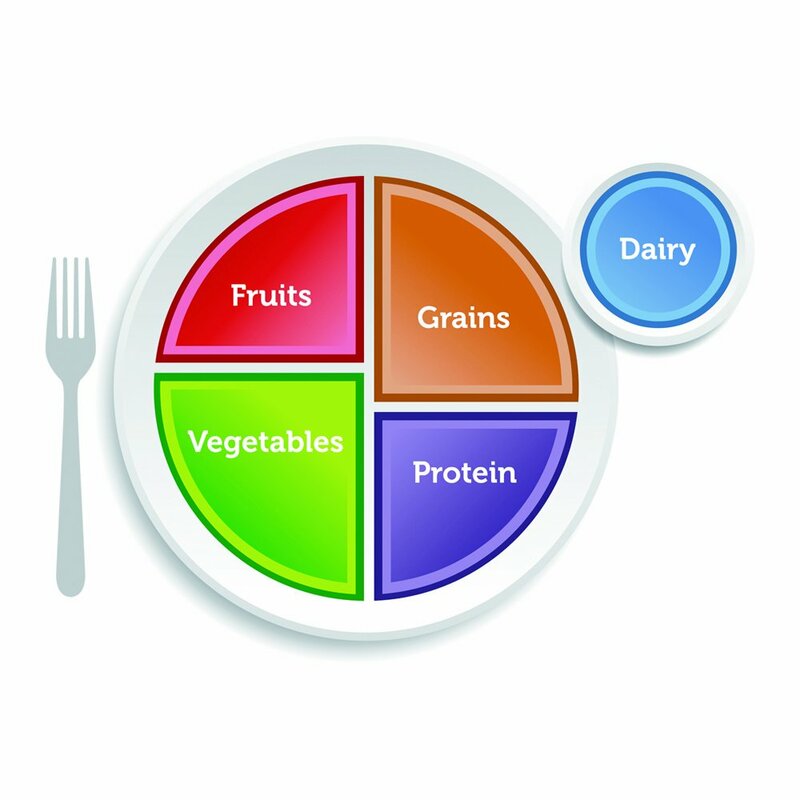 Choosemyplate.com provides more information about healthy living, along with a breakdown of the food portions featured on the diagram, which includes fruits, proteins, vegetables, grains and dairy and provides a list of items in each food portion. The list of fruits on the website includes the categories of “Commonly eaten fruits,” melons, berries, as well mixed fruits and “100% Fruit Juice” options. When you click on the options for protein, you have a list that is divided into sections: meat, eggs, poultry, seeds and nuts, seafood and soy products that are processed. Vegetables are divided into dark green, starchy, red and orange, peas and beans, and other. Grains are divided in two categories whole and refined. The dairy group is made of milk, cheese, yogurt, soy milk that is calcium fortified, and desserts that are milk based. Weight management, calories, physical activity, and healthy eating tips are provided on the site in the section titled Weight Management & Calories. When you reach the step known as Next you locate Daily Food Plans and finally, click Daily Food Plan. You are told, based on your age, gender, weight, height and exercise level, what you may need to do to improve your health. It also provides you with measurements of portions and a number of calories you should intake and tips that will help you plan out and follow your meals. You can also track what you are eating and the exercising you are doing on the site as you follow the guidelines discussed. The site also provides a list of popular topics. As of November 20th, 2013 there were videos added to the site. Information is broken up by “consumer” types including college students, kids, dieters, and pregnant and breastfeeding women. One tab entitled “What’s Cooking?” provides a “Tip of the Day” that can be printed to use on the go. The establishment of MyPlate serves as guidance to having a healthier lifestyle. The chart is supplemented with additional material that makes the diagram even more useful. The goal in mind is to reduce childhood obesity, but the site is essentially a resource for anyone who is wishing to turn his or her health around. Service learning at CCC has been active since Fall 2012. It was created to help students learn about their community and make education more realistic by doing “hands on” projects within their career choices. Service learning is an interactive teaching method which is meaningful for students so they can take what they learn and apply it to real life settings in a community. Methods such as classroom teaching, service to the community, and reflecting and evaluating their experiences is part of the curriculum. Students engage in opportunities for a certain amount of hours per week in an academically-centered service learning project. Students have to exhibit professional ethnics and appropriate behavior abiding to the standard rules of conduct established by CCC. Students also have to complete all assignments and training required. This experience will help students gain leadership skills and connect their classroom learning with a “hands-on” experience that betters the community. The advantages of taking service-learning classes is personal growth and development, civic engagement, and academic enhancements. Students also increase their knowledge about their community, expand their career choices, develop contacts, and add service-learning experiences to their transcripts. The faculty engages service learning in many different ways. Faculty collaborate with local organizations so students can learn to organize outreach programs, work at homeless shelters, and tutor elementary children. Some faculty assign a service-learning project as a mandatory class project. The entire class works on the project as a replacement for an assignment. Don’t confuse community service with participating in service learning. Community service participants volunteer for needs of a particular organization. When engaging in service learning, you’re meeting the needs for your community as well as increasing your academic achievements. There are many opportunities coordinated by the Student Life Office (SLO) for service learning. Dr. Martin Luther King Jr. Days of Service has been one project that is held every January. SLO also engages in other service learning projects to better each participating student’s experience. Faculty and students had traveled around the world participating in planned service learning projects to broaden students’ view and experience. CCC is one of 23 charter members of New Jersey Chapter of Compact. Compact was formed in 1985 as a national organization to advance service learning in higher education. There are 1,200 campuses nationwide, across 34 states. Service learning is available in participating academic courses: Psychology, Sociology, Health Sciences, Freshmen Seminar, Developmental English and Communications. Want to learn more and become involved? Visit Dr. Ayres in the Vice President’s Office Suite located on the first floor of the Academic Building. Or you can call 856-691-8600 ext. 1208 or email kayres@cccnj.edu. Do you worry about your health and maintaining your diet? Do you stress over how many calories you eat a day? Do you constantly watch your weight and worry if you’re out of shape? You should never find yourself examining every part of your body and comparing yourself to other people. By doing this, you cause yourself to feel insecure over the way you look. Even though you don’t want to blame yourself, it actually has to do with how you choose to deal with your weight and diet. Making healthy choices does not have to be hard. What’s the fun of eating if it is more pressure than finishing a chemistry assignment? Going to the gym can help relieve your worries, but if you don’t currently have that one place to go that helps maintain the healthy body you’re hoping for, CCC has just the place for you. 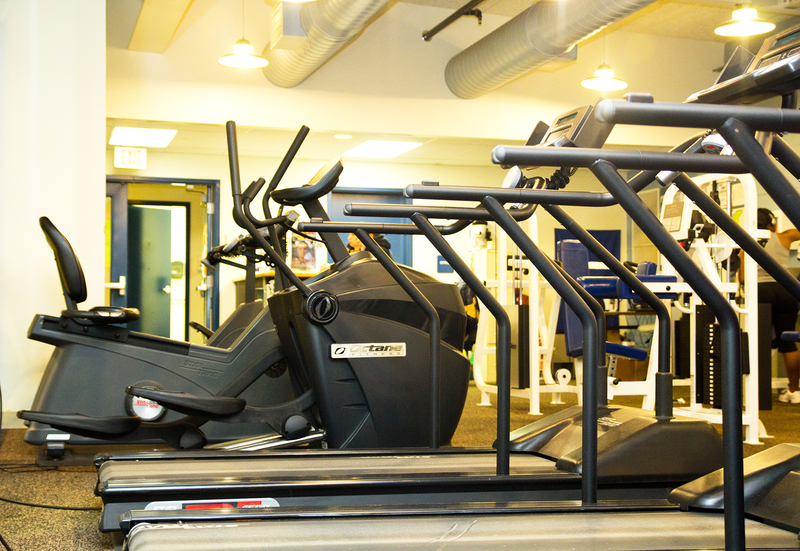 Our fitness center is located right above the CCC gym. It is open throughout the week for the students and staff members with a valid ID from the college. Gym hours are Monday and Wednesday 10 a.m. to 6 p.m., Tuesday and Thursday 7 a.m. to 6 p.m. and Friday 10 a.m. to 2 p.m. I interviewed one of CCC’s gym attendants, Matt Piccone and asked him a few questions regarding his job and gym procedures to help students learn more about the fitness center. Q: Who is in charge of the fitness center and what are their main goals? A: There are four employees who monitor the fitness center. Myself and the other monitors want to make sure everyone who works out at our fitness center is getting the most out of their time. Q: What should a trainer take in consideration when working with each individual? A: Everyone is not the same. A trainer needs to evaluate an individual so they can tailor an exercise program for him or her depending on their current fitness level, age, limitations and objectives. Q: What exercise produces better results? A: To get great results, you should have a mix of strength training and cardio. You can strengthen all the major muscles with the machines and complete some cardio on the treadmill. You also need to remember to stretch to stay flexible and prevent injury. Q: What equipment do you have and what part of your body does each work? A: There are four treadmills, three ellipticals, and three stationary bikes for cardio. There are various strength-training machines that target specific muscles. Some are the shoulder press, chest press, leg curl and leg press. A: You get what you put into it. You can exercise 5 or 6 days a week. Just make sure you rest at least once or twice a week to let your body and muscles recover. Q: What tips would you give to someone who has a hard time committing? A: Exercise with a friend so you can push each other. Once you start exercising on a consistent schedule you will start to see results. Whenever you are down, just think about what you could achieve. Sitting around wont change anything. What are avid gym-goers most afraid of? I can’t speak for all, but this exercise enthusiast is most scared of gaining back weight she has lost from past exercises because of a sedentary metabolism. The American College of Sports Medicine conducted a study in 2010 showing that a relatively healthy person can go to the gym everyday and still not lose any weight or possibly gain weight. This is all because of the way the gym attendees go about exercising. Most exercisers have either a slow or fast approach to working out. If cardio is the first choice of fitness, the person will either keep up a moderate pace on the elliptical or sweat it out on the treadmill for an hour at a time. This may make you feel better at the end of a long day or it may just make your knees hurt. Any workout can start to hinder a person’s chance of weight loss if it is completed steadily and repeated day in and day out. The most efficient way to work out and reach your specific weight loss goal is to practice a little fitness trick called “interval training”. Interval training is a healthy median between rest and motion. It consists of alternating bursts of energy of intense activity with intervals of lighter activity. This means that you can workout for shorter periods of time, with no more grueling hours of walking on the track, and get better results. How does interval training work? It pairs specifically with the anaerobic system, which uses the energy or glycogen stored in the muscles for short bursts of activity. As the exerciser rests, the aerobic system uses the oxygen just worked up from the intense movement to convert stored carbohydrates into energy. This stops the metabolism from stabilizing itself and staying sedentary during exercise. Losing weight means burning more carbohydrates than you consume during the day. With interval training, the body is constantly in motion and the metabolism is constantly working harder than it does usually. By practicing this form of excercise, at rest you are still burning the calories you consume and therefore, lose more weight than you would with other traditional exercises. Interval training could be anything from stair running to speed drills, shuttle runs and jump rope workouts. The best thing about interval training is that it can be done either inside or outside of a gym. Working out in intervals can also really help boost confidence about what the gym is doing for your body and for your life. Some benefits of this type of workout are; burning more calories, improving balance and gives the excerciser less of a chance to get bored while working out. You will also get to work out different muscles than you would normally. Negative sides of working out in intervals are that it could be dangerous if not done correctly. For example, there must be days of rest. These days could be, if you still want to work out everyday of the week, choosing the weekend to simply walk outside and not workout intensely. Anyone with a bad heart or a disease like diabetes should consult a doctor before trying interval training. Some safety tips to keep in mind while trying interval training are; warm up before intervals, figure out where you are currently with your workouts and start slow [do not work out harder than you know you can until you are sure you are ready], bring your heart rate down considerably while at rest, drink fluids while working out, and always workout in a safe area where you can get to help if you need to. How can you get started with interval training? Go to your gym and find a trainer that can explain to you the benefits and proper ways to include interval training in your life and your workout. Look online for sample exercises to start. Youtube is a great online website to find sample excercises for free. Looking to try something that excites your workout and helps you lose the weight more efficiently? Interval your life! Throughout our lives we aspire to do great things. We envision our success in whatever we dream to do or become. Unfortunately, the dream we hope to fulfill is not always achieved as planned. For young and adult women who find themselves in that predicament, the Soroptimist: Best for Women organization is ready and willing to make their educational dreams a reality. Soroptimist is an international organization of professional, political, and business women who focus on raising funds and awareness of the issues connected to woman and girls who have been through human trafficking, and struggle with abuse of all kinds. The organization is located in about 120 countries/territories to date where almost 100,000 Soroptimist members contribute their time and financial aid to community based projects that aim to benefit the female community all over the globe. On a smaller and more local scale, there is a chapter of Soroptimist named the Soroptimist International of Cumberland County. The local chapter, chartered in 1937, is lead by chair woman Donna Pearson, a sociology, cultural diversity, and social work course adjunct, who has been with the Soroptimist: Best for Woman organization for over ten years. Pearson, along with many other hard working female members of her chapter, raises money each year to make deserving women’s educational dreams come true. The money collected throughout the year, will take the form of the Soroptimist Women’s Opportunity Award (WOA) cash grant. The WOA, which began in 1972, is the major primary public service award that is given to accommodate women, girls, or both who are trying to improve their lives. The award can be used to offset the cost of books, other necessary educational materials, childcare, carfare, or any other education-related expense. To become eligible to receive the chapter’s award, the individual in question must either be enrolled in a college or vocational school that is part of Cumberland County. An application must also be filled out to have an opportunity to receive the award. 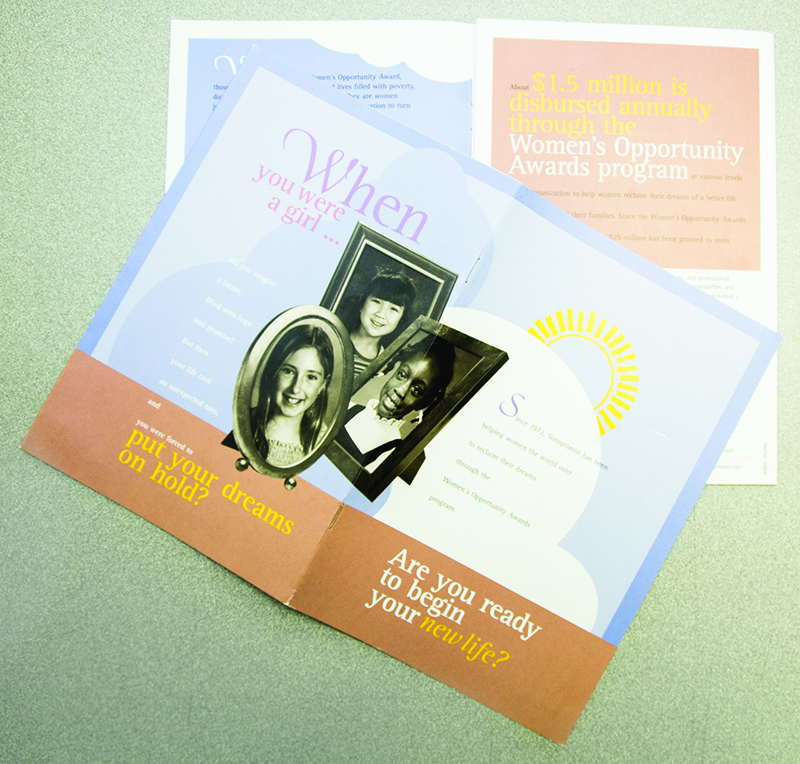 A physical paper application can be found on campus in the financial aid or foundation offices, by contacting Pearson, or online at http://www.cumberlandsoroptimists.org free of charge. After filling out the application, it must be accompanied by three references that support the need for aid and a personal statement or essay before it is handed in for review. Similar to other scholarships, the personal statement must include the reasons why the aid is necessary. These three components [application, references, and personal statement] allow the committee of women, choosing the recipient, to have information which supports the reasons why a particular individual deserves the cash grant. The applicants are graded by a point system and ranked by how they present themselves through the information they provide. The applicant with the most points wins the grant. The amount awarded to the recipient is never set in stone. The amount of money given to the individual that is chosen is based solely on how much the community chapter accumulates throughout the year. After a winner is chosen by the committee, they will advance to Soroptimist North Atlantic Regional level, where one recipient will receive a cash grant. The entire program will culminate with finalists who will receive other cash awards. The applications for the award must be fully completed with all of the necessary information and returned to Soroptimist International of Cumberland County by December 15, 2013.